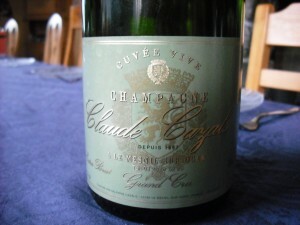 Champagne Claude Cazals is located in Mesnil-Sur-Oger in the Côtes des Blancs, the home of the Chardonnay grape in the Champagne region. This wine is 100% Chardonnay and is without dosage (the sugar in the form of grape must that is added after the second fermentation). Malolactic fermentation is not encouraged, but can occur spontaneously. The number of months on the lees is not known. Claude Cazals is a Récoltant Manipulant (a grower that also makes wine from its own grapes (a maximum of 5% of purchased grapes is permitted)). You will find the intials RM at the bottom of the label in small letters. Typically, these houses produce smaller quantities of wine than the “Big Houses” do and very often these Champagnes are more affordable as well. These are the Champagne’s I prefer to drink. We drank this Champagne as an aperitif. It had a very fresh nose which included aromas of green apples, autolysis (yeast) and minerals. On the palate, again green apples, minerals and autolysis. This wine was very fresh and concentrated and due the high level of acidity, could benefit from a year or two in the cellar. I felt that at times, the acidity seemed to be the most notable attribute of this wine and it slightly overpowered the fruit and overall balance of the wine. The finish was very long and had some bitter notes not unlike the bitterness you find when chewing apple seeds. A very well made Champagne indeed. One I wouldn’t mind storing for a few years to see if it improves.